If you’ve got the busy seasons blues, take heart. We’re entering the time of year when all your hard work pays off. Busy season is finally almost over, and I have mixed emotions. I wasn’t exactly ready for the rush so I was playing catch up the whole time. I don’t feel I was able to fully capitalize on every car that came through the bays, and now I’m worried about how my business is going to do in the upcoming slow season. How can I maximize on my next busy season? Well, first of all, congratulations on making it through one of the most hectic times of the year! I know it’s not easy. And now that things have settled down, it’s time to look back and reflect on where the whole process could be sharpened up for the upcoming busy season. If you’ve read my previous article you’ll know I am a stickler for strict processes – whether it’s at the front counter process, in the bays, or in preparation of a busy season. You need a structured process… and that has to begin in your slow season. Almost every shop experiences the cyclical patterns of busy and slow seasons. March, April, and May are the crazy months of spring. October, November, and December make up the pre-winter rush. It’s your responsibility during the slow times to fully prepare for the chaos that comes in those months. Let’s first take a look at what makes shops busy. In Canada, it starts with winter tires. About 78% of people get their mechanical work done where they purchase winter tires. If you’re not actively selling winter tires, or able to service the mechanical needs of your tire-buying customers, you’re leaving money on the table. You need to ramp up your tire game so you can meet all of your customers’ tire needs. That starts with tire quoting. I always recommend having online tire quoting capabilities right on your website. This will save time quoting over the phone as well as help with your online advertising. Beyond that, you need to ensure that your tire-quoting matrix is updated and all of your advisors understand how to quote tires accurately. Another important aspect of preparing for tire season is tire storage. Tire storage adds extra value to the service you’re providing for the customer as well as guarantees customer retention for the following season. There are different services that provide tire storage or you can choose to do it in house. Whatever you choose to do, I guarantee it will be a smart financial decision. Finally, make sure your tire equipment is in full working condition and will be able to handle the influx of extra work. Along with the equipment, make sure you’re fully stocked with proper tire inventory such as tire weights, and tire bags. But being fully prepared for tire season is only one piece of maximizing on your busy season. In order to make money, you must be prepared to capitalize on all the potential mechanical work that’s coming through your doors. Again, this is another aspect of the process that needs to be fully communicated and practiced. In order to access the mechanical work, shops need to implement a basic courtesy inspection on all cars that come into the shop. This boosts both overall customer satisfaction as well as shop revenue. Although this inspection does take extra time when space in the bays is so highly prioritized, it is without a doubt one of the most profitable decisions a shop can make. If you add an inspection to your service process, however, make sure you inform your customers about it. It’s extremely important that they know an inspection is coming so there’s no confusion or surprise when the results are revealed. The key to having a profitable off-season is to perform routine inspections during the busy season. That’s right. As busy as you are, you’ve got to find the time for inspections. This, along with consistently obtaining proper CRM data, can almost always guarantee consistent profit margin during the slow time of year. CRM stands for customer relationship management, and it includes all of a customer’s basic contact information and the pre-booking of their next appointment. 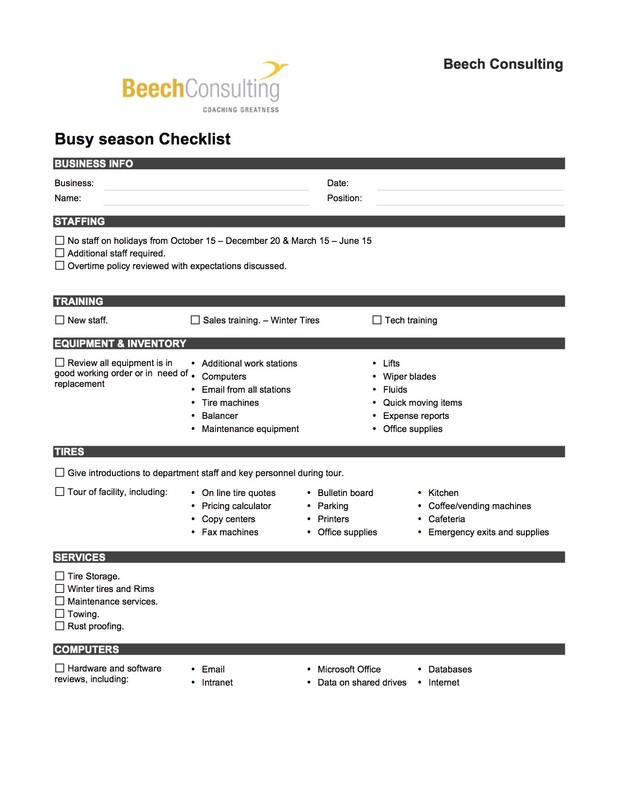 If you’re doing inspections every visit and updating their file with any upcoming or deferred work, you’re well on your way to having a productive off-season. I fully understand the non-stop rush that is the busy season. Nevertheless, it is important to take the time to pre-book upcoming appointments for every customer who comes in. This action alone will help ensure that you have cars to fill the bays when the tire changeover season slows down. Let’s spend some time talking about what you can do to ensure that you’re capitalizing during ‘opportunity season.’ That’s how I’d like you to think of slow season from now on. It is ‘opportunity season’ for growth in your business. This is the time where you can tackle any renovations that you’ve been holding off on or employee training that you haven’t had the time for. Ongoing training for both your technicians and service advisors is extremely important for your shop to remain relevant and ahead of the competition. Take this time to reflect back on your busy season, try to pin-point where you fell behind. If you’d had another service advisor working the counter, would you have been better able to stay ahead of the rush? Now’s the time to take on a new advisor. The slow season is ideal for training a new hire. easy to fill as opposed to a certified technician. A quality technician is extremely difficult to find these days and should not be someone you let go lightly. There are other items that must be looked into in preparation for the busy season. I have created my own busy season checklist. I highly recommend you take a look at my checklist as a frame of reference and add in any extra items that are relevant to your shop. Being organized and prepared before the start of the busy time can make a huge difference to the overall productivity and success of the season. It’s the nature of this business that there will be busy times and there will be slow times and it is essential that you’re fully capable of producing and making money during both seasons. With every season comes opportunity and it’s your role as shop owner or manager to seek out and cash in on these opportunities.